This project is how to model the driving behavior, such as cautious or aggressive driving, from data of sensors on cars. Specifically, our method learns the model fitting to each individual driver, situation, and physical condition, even if the training data are taken in just a few short minutes. 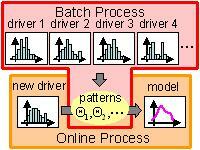 First, this method extracts several behavior patterns from multiple drivers’ data. Then, it applies the model of the similar patter to the current subject’s data. Since our approach is based on an inference called Dirichlet process mixtures [Escober et al. Journal of the American Statistical Association 1995], which can estimate the number of patterns as well as the optimum combination and parameters of each pattern, it can estimate the accurate and efficient models independent of the data size. The results of experiments by using actual driving records show that our method is superior to conventional methods.